Church Fundraising cookbooks will provide you successful profits and numerous success stories. Fundraising cookbooks at your local church is fun, and promises proven success. Thousands have used our cookbooks fundraising program, and have raised thousands of dollars. Local hometown recipes are shared time and time again. What better way than to have a cookbook fundraising event at your church. Start your church fundraising. After working with over 100,000 groups that have raised millions with our step-by-step Cookbook Fundraising Program, Fundcraft knows fundraising campaigns! We guarantee in writing that any fundraising group that follows our Original Cookbook Program will raise enough money to pay for the cookbooks or they can return the books for full credit. Our guarantee is very simple - the more books you order, the more recipe contributors you must have to sell the books. This fundraising cookbook program [for community, church and school fundraising projects] has proven success for over 60 years. Fundraising...Why do cookbooks sell? It’s simple. People love good food. Your personalized cookbook will contain dozens of flavorful recipes that have been family favorites for years. The best cooks in your community will jump at the chance to see their specialties in print. They’ll want to buy copies, as will the many friends and neighbors who have sampled these tasty treats over the years. Your fundraising cookbook will contain the secrets behind these delectable dishes and everyone will want a copy of your community or church cookbooks. Remember, community fundraising, school fundraising and church fundraising can be fun and assist you to publish a successful cookbook! Family Heritage...Family recipes are a treasured resource of any heritage and should be preserved for the younger generation. Many families collect recipes from family members and celebrate the book at a family reunion, selling to family members not as a fundraiser but as a collection of favorite recipes handed down through the years. Business Promotions...Many Fundcraft customers will develop a personalized promotional cookbook and sell for profit, while some will give cookbooks to customers in appreciation of their patronage. A promotional cookbook with good recipes will be used for years to come, while other gifts are forgotten or discarded. Cookbooks also work very well for banks as gifts to new customers, cookbook-publishing or for mortgage and real estate companies who wish to reward patrons for their business. 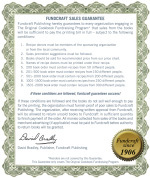 Fundcraft Promotions at www.fcpromotions.com sells thousands of promotional cookbooks. We have made the job of creating a professional personalized cookbook very easy with our unique step-by-step program. For many years, Fundcraft has been the leader in the personalized cookbook field, due mainly to our simple program which makes the project fun for all involved. We publish more cookbooks each year than all of the other publishers combined. We guarantee that your cookbooks will sell (in your church fundraising), if you follow our simple marketing program. If for some reason the books don’t sell and you followed our program, you can return the books for a full refund. For more information, please refer to our View Sales Guarantee »».